At the approach to the main gate of Vandenberg Air Force Base, there is an intriguing yellow sign with black letters: Lompoc Casmalia Rd/ Closed Use/San Antonio Rd West. To most people, the closed road is of little concern. Casmalia is, after all, a small unincorporated area of some 200 souls. The business district is composed of a post office, one minimal grocery store and one restaurant. To some people, however, getting to Casmalia is important. So these people turn right onto Highway 135, go down the first long hill, and turn left at the San Antonio Road sign, proceed through a valley of tan, grassy hillsides, keeping alert for the signs BGolf CourseC to the left and BCasmaliaC to the right. Nine and eight-tenths miles from the main gate, a big sign shows up announcing two entities: BHitching Post, World?s Best BarbecueC and BCasmalia.C Some people feel that getting to Casmalia is worth this effort. Why? For one thing, the trip gets you into California back country. Casmalia was settled by ranchers and Union Oil workers in the late 1800s. The town was a railroad depot at one time, boasting 1,500 residents. H. H. Heller?s Casmalia Hotel was a thriving hotel and bar, with 11 rooms to accommodate oil field workers and railroad men. Five miles west, along Point Sal Road to the beach, was Port Petrol, where crops and cattle were shipped by sea to San Francisco. When the rail line was diverted elsewhere and the depot was closed, and many of the oil wells shut down, the population dwindled. In 1922, Paul and Oliva Veglia, fresh from the Piedmont area of Italy, bought the Casmalia Hotel. Oliva was reputedly a fantastic cook. She served Italian home-cooking family style. Hands down, the reason most people go to Casmalia in the 21st century is to dine at this same eatery. In 1944, the Veglia?s son, Mario, tore down the hotel rooms, renovated the restaurant, changed it into a steakhouse, and renamed it the Hitching Post. In 1952, brothers Frank and Victor Ostini bought the business. The Ostinis cooked 18-ounce steaks in an enlarged barbecue pit over a red oak fire. A complete steak dinner cost ,3.75. The Hitching Post became famous far and wide. How famous? One day a small airplane landed in the pasture near the restaurant. The pilot and passengers got out, posed for pictures in front of the Hitching Post, and flew away with proof they had been there. My reason for going was not for barbecue. I wanted to get the hang of this unbelievably small town, perhaps because of my own upbringing in a Missouri town, population 400. How to begin? I knew of only one lead: the Hitching Post folks. I called. Terry Ostini Stricklin, daughter of Frank and present operator of the Hitching Post, answered. When I got to the plain red wooden building, adorned over the entrance by the only big sign in town, Terri and Vic Veglia (BThat?s VEH-lia. The >g? is silent.C), grandson of Paul and Oliva, were waiting inside at the bar. Except for us, the place was empty, closed until the evening dinner hours. Terri and Vic talked about their families, the generations of Ostinis and Veglias who preceded them, and about characters that had frequented this room, men such as BJackomini,C the big Italian who would sit 5-year-old Vic on his lap and feed him jerky and dried salmon until he threw up. As they talked, the building became, in my mind, crowded with its history. For over an hour they gave me a look into the heart of Casmalia. Vic spoke about how his grandfather hauled sugar beets from Casmalia to Port Petrol by mule team. Farmers thereabouts also grew barley and mustard and beans. It was also by mule team that he and Joseph Tognetti and Joe Albertoni pulled the Bfresno,C the road grader of its time, to create the road to Point Sal. 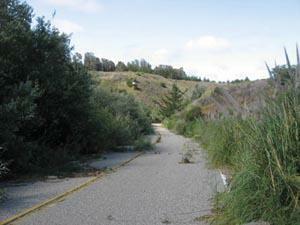 As they were cutting the road bed, they often uncovered Chumash artifacts. Any talk about Casmalia?s more recent history eventually turns to the subject of the Casmalia Resources. That was the name in 1973 for the then 61-acre dump located a mile and a half from where we were sitting, out of sight over the tan grassy hills of the Bognuda Ranch. When it opened, the facility received mainly local agricultural and oil waste. But things changed. Terri remembers a day in the 1980s when a man from Casmalia got hired to go up to the dump and paint some trucks. Up there he saw open pools of toxic waste. It was the first explanation the townspeople had for the peculiar odor coming from that direction on the wind. It smelled like rotten eggs and permanent hair solution. People began to complain of headaches and nosebleeds and serious illnesses. One local doctor, who himself ultimately became so ill from the noxious air that he moved to Arroyo Grande, saw so many patients with the same symptoms that he dubbed the condition BCasmalia syndrome.C The teacher and the principal of the school both became ill and closed the school. 5.6 billion pounds of waste, including acids, bases, organic solvents, pesticides, and oil drilling sludges.C It wasn?t just local waste accumulating there. It was coming from as far away as Los Angeles, and it contained hazardous material. Terri told of the continual traffic of trucks, sometimes as many as 500 a day, on the road within half a mile of town, carrying waste to the dump. Dumping wasn?t cheap; the fee was ,2,000 per truck. It was, however, lucrative. Terri became the community contact person between the town and the Environmental Protection Agency. After years of struggle that included complaints, denials, public hearings, sit-ins at the site, and demonstrations at the state capitol, a class action suit against Casmalia Resources and Hunter Resources Inc., owned and operated by Kenneth H. Hunter Jr. and associates of Montecito, got results. The dump was closed in 1989, labeled a Superfund Site by the EPA, put on the National Priority List for action, and a clean-up was ordered. Residents of the town received cash payments in restitution for health problems. A few days after my visit with Terri and Vic, I arranged with the EPA office in San Francisco for a tour of the dump site. The dump had been active for 16 years and had been closed for 10 years. I arrived anticipating a look at the waste ponds, evaporation pads, trenches, and landfills. My BtourC consisted of being greeted by the friendly guard, parking my car, getting into a vehicle driven by a cordial site employee, and being driven about half a kilometer down a road. The truck stopped. I got out and looked at the view 8 one pond with some ducks swimming in formation and three wide, sloping, terraced hillsides of more than a dozen grass-covered former landfills. One could scarcely imagine what those green terraces looked like and smelled like before they had been covered and allowed to go to grass. There were more ponds over the hill, I was told. I was also told that this was as far as we were going. I was not told why. It was still early in the day, so I drove the mile and a half back to Casmalia to hang out again. Call me easily entertained, but I have seldom had a more delightful two days than those in Casmalia. Allie Kay Spaulding can be reached at alliekay@verizon .net.